This study was performed to demonstrate how routine X-ray CT inspection adds value to medical implant production, ensuring quality and reliability. This particular case is for 3D printed (additively manufactured) titanium hip and knee implants but the methodology is applicable to all manufacturing techniques, not only additively manufactured implants. X-ray CT inspection is relatively expensive compared to older inspection methods, but is significantly better as it allows entirely new insights and streamlined workflows, saving costs long-term and providing higher reliability in inspections – which is ultimately better for the patient. This case study aims to show that the costs are not excessive, and is based on current costs for CT inspection services at the Stellenbosch, South Africa, CT facility, which is a relatively low-cost service facility compared to international X-ray CT inspection services. This is an example of a relatively routine inspection – for special cases such as higher resolution requirements, denser metals, or specialized scan parameters, the costs can be higher. In some cases costs can be lowered for simpler inspections, simple samples and easy-to-detect features. This case study is a typical workflow and a good indication of costs – especially for new users of the technology. Two samples were provided by Executive Engineering (www.execeng.co.za), who produce these parts under contract for LRS implants (www.lrsimplants.com). Executive Engineering is a company on the outskirts of Cape Town which has a newly established metal additive manufacturing facility, with an EOS M290 currently running only Ti6Al4V. LRS implants specialize in design and production of custom medical implants. The two parts are biomedical titanium alloy Ti6Al4V (ELI) material and are parts of hip and knee joint implants. They are shown in Figure 1. Lattice regions are included to improve long term bone-in-growth and attachment. Both parts were scanned at typical parameters used for this material, at resolution defined by the sample size. For more on scan parameters and optimization. X-ray CT is a technique that has many capabilities – it can be used for many things. Obviously when you want to do everything – it costs the most. We break it down into different levels, you might only want one of these, but we demo everything here. The first level, which could be called manual CT inspection, is the simplest and lowest cost. This involves simply checking the part in virtual cross section images (called CT slice images). After scanning and basic data handling, the inspection is done by viewing cross-sectional images. This can be done by the user himself, requires no complex software tools and easily and clearly visualizes even small internal flaws which might be problematic. (shown below in different slice views of both implants) In these images, everything in the white line (all white and grey areas) is metal, and black is air. In this part no unexpected cracks or flaws were found. For examples of porosity, cracks or flaws please see previous case study – for a cast metal part. Major flaws would be in the form of dark black areas and lines in the white material, which are not present here. Manual inspection requires a scan of high quality, and basic data handling to generate clear well-contrasted slice images. Usually the CT service provider highlights “indications” – areas of potential flaws. This can also be handled by the customer himself, either with slice image stacks, video or full data with free 3D viewer program. This program is called Volume Graphics myVGL and is freely available for all data handled by Volume Graphics VGSTUDIO MAX 3.2, which is also the software used for this case study. This provides clear insight into the presence of flaws and is suitable for all parts (as the method is entirely non-destructive) or can be applied to selected samples from batches produced under identical conditions. For the scan + basic data handling, the cost is R2900 (US$330). This provides clear insight into the presence of flaws and is suitable for all parts (as the method is entirely non-destructive) or can be applied to selected samples from batches produced under identical conditions. This price is applicable to decent quality scans without special requirements, i.e. it is for typical implants of light metals, in the range roughly 50 – 150 mm in longest axis. Smaller or larger samples might require some variation of scan protocols which adds to the cost. Besides using this method for checking to ensure all parts are flawless (and reject those that aren’t), it is also possible to use the method for calibration of systems and production process checking – using smaller test parts. This provides a fixed, documented result of the same test geometry analyzed the same way over time. This allows insight into the production quality and any progressive quality issues developing over a longer term. This is a topic which is highly applicable to all forms of manufacturing, but is especially useful for additive manufacturing where many factors can affect the quality of the final product. 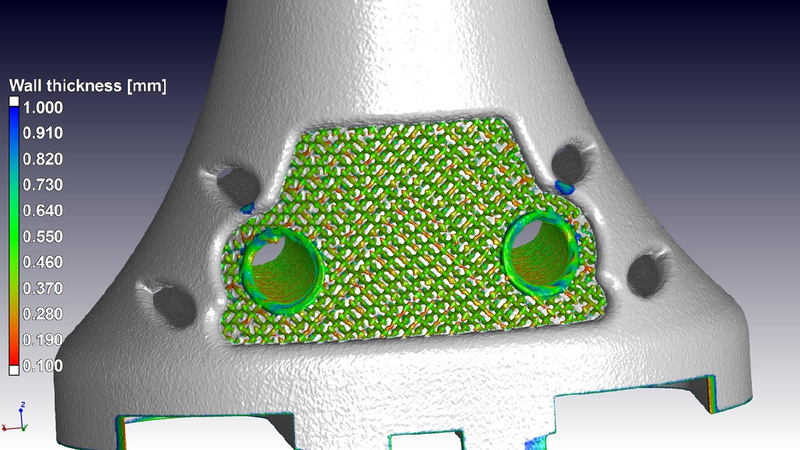 A quantitative defect analysis function allows color coding of pores inside the part, when this is found. This method is particularly useful when testing small coupon samples for optimizing the production process, ie. when improper settings cause some porosity or flaws. The advantage of a quantitative 3D colour coding of defects is the ability to understand the 3D shape and distribution of the flaws relative to the part features (e.g. near critical areas, or showing what the cause of the problem is, to more easily and faster fix this problem). For this case study, the next level of insight is the use of the same scan data for metrology – that means accurate dimensional measurement, often done traditionally with coordinate measurement machines (CMMs). The accurate surface determination allows various selected dimensional measurements such as diameter of critical cylindrical cavities shown for the part in Figure 3. In addition the STL file data can be exported, or preset dimensional analysis can be performed on batches of parts with accept/reject criteria. For typical CMM measurements of up to 10 features, the additional cost is $165. For batches of similar parts more measurements can be preset and run automatically for the same price. The next level, also costing the same ($165), is comparing the actual produced part with its CAD design file, to see where large deviations occur. The implant is shown in Figure 4, with most of the part within 0.3 mm. The scan resolution here was 65 µm – and with good scan data up to 1/10th the voxel resolution can be used as the accuracy of the surface values. This means the surface data is likely 6.5 µm accurate, without any limits on hidden or complex features, or limits on surface finish which are sometimes issues with CMMs. A useful additional tool is wall thickness analysis (additional R1450 or $165) – this method shows the thickness of walls of the part, mostly used for checking traditionally designed parts with parallel walls. It can also be used to visualize and check the thickness of very thin and complex areas such as lattice structures, as shown in Figure 5. Here most of the lattice is within 0.2-0.5 mm thick. The method used here is the sphere-method – the largest sphere that fits in the material at each point is reported as the wall thickness at that location. What are the limits and how to overcome them? This means that for one part, for an all-inclusive analysis of everything possible, it costs less than R10 000 ($1140). While this is more than traditional nondestructive testing (NDT) tools, the clarity and quantitative assessment allows to really improve the lives of patients, to clearly identify when even small flaws or manufacturing errors are found in parts. On the other hand, even the first-level of analysis is useful for this purpose, bringing the cost down by almost 70%. Further cost reduction might be in optimizing and calibrating the production process itself using CT on a regular basis and not inspecting all parts produced. Any way you look at it, the insight into implants with 3D X-rays is clearly value for money.